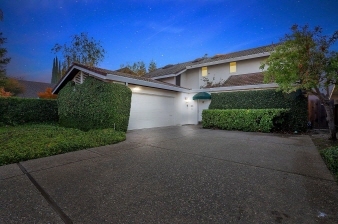 Pristine property with Beautiful views of Quail Lake. Gorgeously updated throughout. Open Floor Concept with vaulted wood beam ceilings, tile flooring, fireplace, and large french doors that lead to the back patio and dock. Tons of natural light! Second story carpeted loft, master bedroom with large walk in closet with built-ins. Master bath completely remodeled with separate shower. Lots of natural lighting throughout! Close to restaurants and shopping!